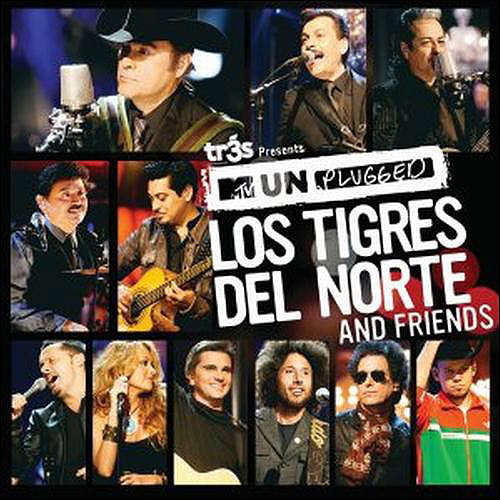 “MTV Unplugged: Los Tigres Del Norte and Friends” is the latest multiplatinum effort by the celebrated hit making group, Los Tigres Del Norte. The compact disc is a performance which was recorded in the Hollywood Palladium back in February. It features musical cameos by Zack De La Rocha, Andrés Calamaro, Diego Torres, Calle 13, and pop diva Paulina Rubio. The album has been a successful venture in the states as well as the rest of Latin America propelled by the success of the revived “Golpes En El Corazón” featuring a duet with the previously mentioned Paulina Rubio. Los Tigres Del Norte are the one band that I inherited from my parents although we enjoyed them for entirely different reasons. My parents liked the cumbias filled with double entendres while I heeded their messages evoking social justice. In fact, I had to buy all of my own albums because my parents would not allow me to record any of their 8-tracks onto tapes, claiming that it would somehow disintegrate the integrity of the album. The Good: The set list is both lean and mean. This disc does not drag. It has a musical urgency that is almost comparable to the Ramones. Most of the musical cameos only add to the songs instead of becoming a showcase for the artistic contributor. The Bad: One of my only complaints is that Los Tigres Del Norte have so many songs in their arsenal. My only wish is that this could have been a double disc — so that more songs could have been inserted. I wish I could have seen the biting “El Circo” about the Salinas de Gortari brothers, which is more gangster than anything Eazy E. ever came up with. I would have even enjoyed listening to “Tres Veces Mojados” which was the first song I could ever recall detailing the struggles of a Salvadorian immigrant goes through just to make it to the land so many of us simply take for granted. The Ugly: Zack De La Rocha sounds like he is completely out of place in “Somos Mas Americanos.” It almost sounds like he is fighting the urge to go into a rendition of “Bulls on Parade” although the bass line for “Killing in the Name” is played right before his contributing duet. The other wrinkle on this compact disc is that LTDN are coming close to sounding like a parody of themselves on some of their musical deliveries. It happens all the time. Take a listen to some of their contemporaries. Kiss singing about wanting to rock and roll all night and partying every day is sad enough. The Who wanting to die before they get old – irrelevant, tragic and yet still sung. After 50 years, do any of us believe that Mick Jagger can’t find satisfaction? LTDN are treading in those waters when they stake their claim as “el jefe de jefes.” They are still relevant, and it would be depressing to see them every summer drudge out “the hits” just so they can be noticed – a la Aerosmith. The Bottom Line: This is a good alternative for beginners who do not want to start off with a greatest hits compilation. Like most unplugged performances, there is no ground to be broken. This particular performance is not as classic as the Nirvana performance, but is also not as bad as the Lauryn Hill performance. I would have to rank it somewhere in between Stone Temple Pilots and the Counting Crows. My suggestion is that you accept it as a gift or give it as a gift – otherwise you will not be satisfied with your purchase.